Codice prodotto: CND.214102K. Piumino doppio capo bambina 4in1, interno staccabile. Interno 100% poliestere. Fodera 100% poliestere. PELLICCIA SINTETICA. GIACCA BAMBINA. per BAMBINA 11/12 ANNI. Superdry Tall Marl Toggle Puffle Jacket-Burgundy- XXS 30 Chest. Inside, the puffle jacket is fully lined with a soft and thick fleece fabric. The jacket is finished with an embroidered Superdry logo on the back. 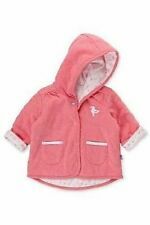 RALPH LAUREN, VERDE, GIACCA TRAPUNTATA BAMBINA, 2T (2/3 ANNI). Lightweight with polyester filing. Ralph Lauren label Size L(12-14). Coat hanging loop. Collared with brown corduroy edging on fronts, hem and cuffs. Lined in brown. Length from mid shoulder to hem 22". BNWT Nike Sportswear Down Fill Jacket. Full zip Fastening with Zippered side pockets - fleece lined pockets for added warmth. 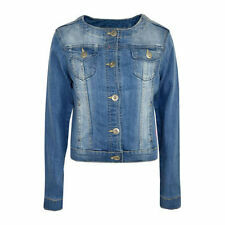 Bambino Guess ragazze in eco shearling trim blu denim giacca di jeans con fiori ricamati sul davanti. Material Denim. in genere notiamo forti odori (odori di fumo/muffa/deposito) e li si nota nell'elenco se sono presenti. This Gorgeous Black Padded Parka Jacket from New Look with a Faux Fur Hood is perfect for keeping the cold out. 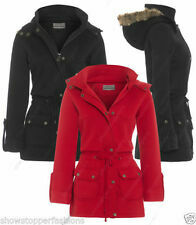 Featuring a Padded Outer, Zipped Pockets, long sleeves, Faux Fur on hood and a Polyester Lining. Faux fur leopard print jacket from the New Look 915 range and labelled as age 14-15 years, but would also fit a ladies UK 8 or 10, possibly 12 easily. Lovely soft and cosy feel faux fur with hook and eye fastening, giving an 'edge to edge' look when fastened. Spyder Logo sulla manica sinistra. Pattern Spyder Logo on left sleeve. La tua giacca preferita per molti inverni a venire. Material •700-fill down alternative. Color Black/Acid. Style Down Jacket. Collezione di chiusura lampo su ordinazione. 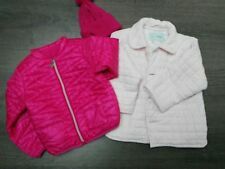 GAP Kids sherpa style jacket. Warm furry collar with plush check wool blend fabric finish. Four pockets to front with banded cuffs and waistband for improved fit. Here at Quality Clobber we’re passionate about fashion. Ha un top di velluto con giacca ecopelle e gioiello. La gonna è a pieghe. Season Spring. Sleeve Length Short Sleeve. Occasion Dressy. Country/Region of Manufacture Philippines. UPC Does not apply. Material Velvet. Giacca invernale bianca bambina 11-12 anni OVS PERFETTA con cappuccio e cintura.